- On a "fixed" video file, the Log says 0 warning / 0 errors but whatever the player ( Windows, MPC or VLC ) no vidéo. The Log however indicates multiple problems such : "ES ERROR : H264 sequence parameter buffer overflow 00:00:05.684 size: 427 " & so on. What does that mean ? Anything to correct that problem ? this sounds almost like a problem that I've reported last week already. 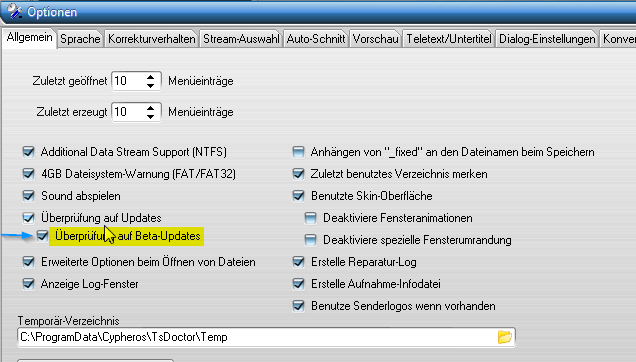 It has been fixed in the last beta, you might give it a try (activate download of beta versions in the settings of TSDoc). If it is not solved, I am afraid you might need to upload your recording to the programmer here so he can take a deeper look. Your station may use uncommon settings that have not been seen before, so it will be better if he analyses it deeply and the program takes precautions for such events. Thanks for your reply, I am just back home. I have activated "beta version" but it does not seem available ?? ( Presently I work with 1.2.171). Anything more to do to get it ? In the menu under Help you will find "Search for updates". 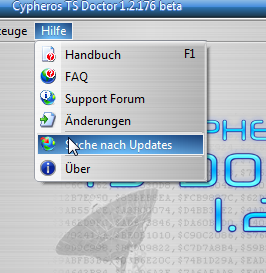 I looked "search for updates" but no beta version... You indicated a new version 2 was coming soon. Is that problem will be taken into account ? ( I mean at least the problem reported by Mam )? I already did what you mentionned above but instead of getting that panel "beta update 1.2.179, it says "no update' available" although I have the current version 1.2.171. What else to get it ? The H264 picture parameter set and sequence parameter sets are to long for TS-Doctor to be recognized. This is no error in the file but TS-Doctor has some problems to detect the video parameters. What is the source of this file? Does not look like a DVB recording.